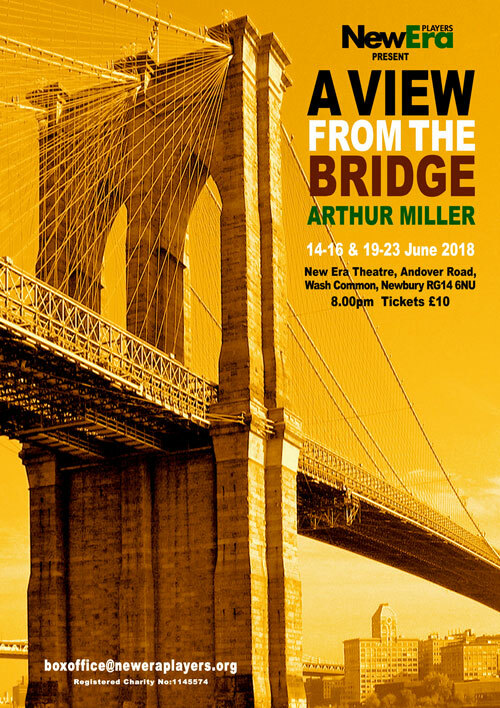 Arthur Miller plays often explore the tragic consequences of people’s actions and man’s inability to accept change, and A View from the Bridge, like All My Sons and Death of a Salesman, follows in that vein. 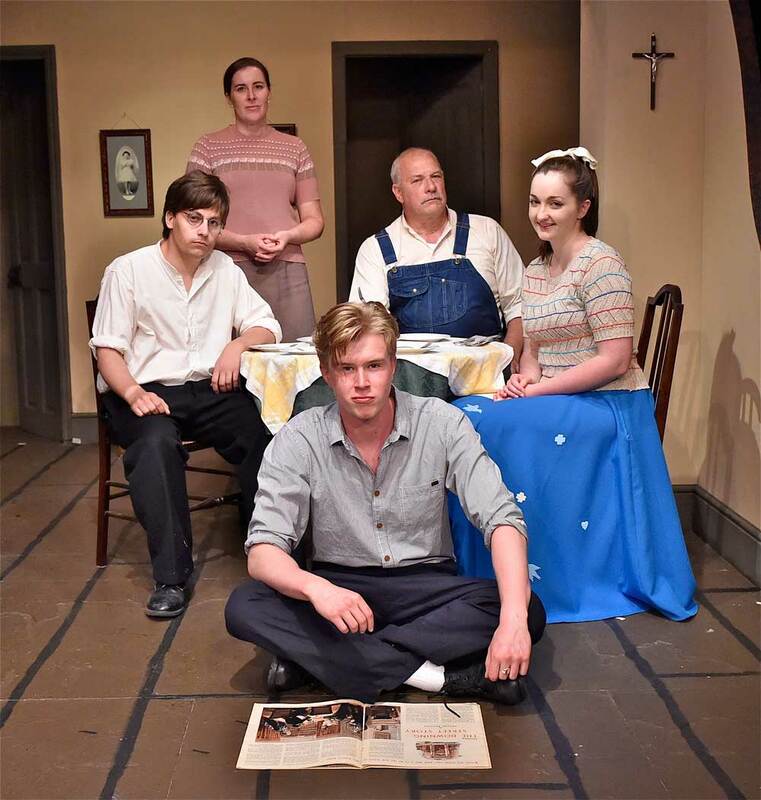 Set in 1950s Brooklyn, the play chronicles the descent of Eddie Carbone into jealousy and betrayal. Eddie lives in a small tenement flat by the docks with his wife Beatrice and niece Catherine. He’s a good guy, gets on with his neighbours and enjoys a quiet home life. But, when two of Beatrice’s Italian cousins arrive as illegal immigrants and Catherine forms an attachment to one of them, it is the beginning of Eddie’s downfall. He is obsessed with his niece and can’t bear the thought of her leaving home or falling in love. As his jealousy grows, so does his sense of reason and when he reports the two boys to the authorities, Eddie is shunned by his wife and neighbours and pays the ultimate price. 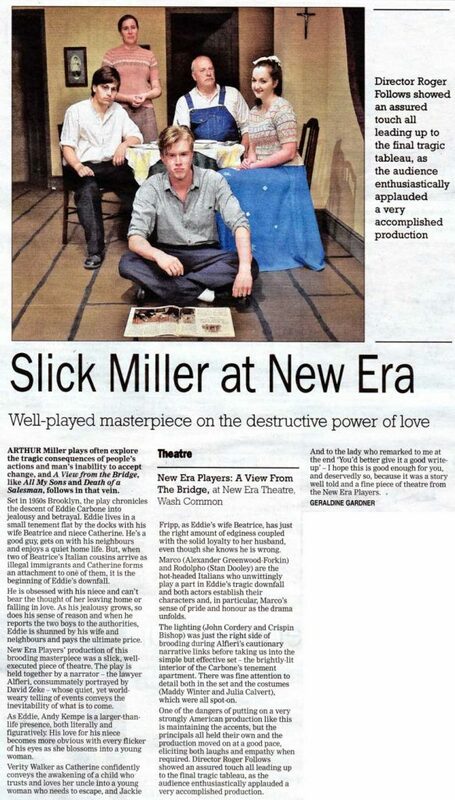 New Era Players’ production of this brooding masterpiece was a slick, well-executed piece of theatre. The play is held together by a narrator – the lawyer Alfieri, consummately portrayed by David Zeke – whose quiet, yet world-weary telling of events conveys the inevitability of what is to come. 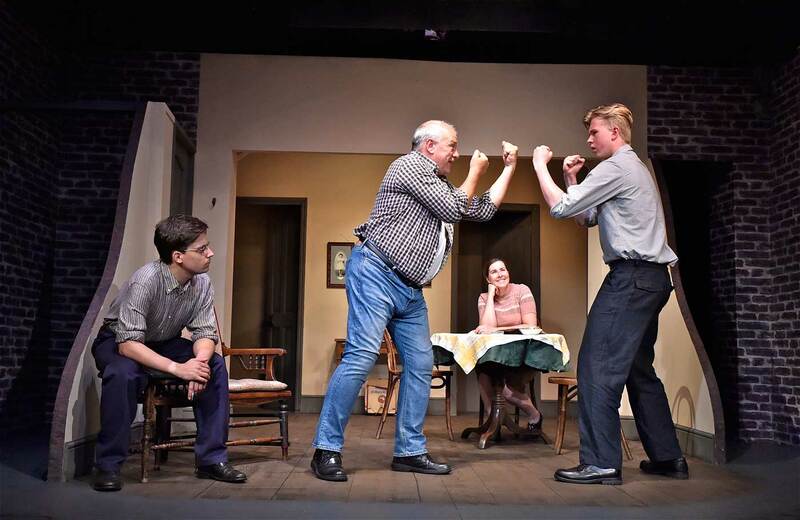 As Eddie, Andy Kempe is a larger-than-life presence, both literally and figuratively. His love for his niece becomes more obvious with every flicker of his eyes as she blossoms into a young woman. Verity Walker as Catherine confidently conveys the awakening of a child who trusts and loves her uncle into a young woman who needs to escape, and Jackie Fripp, as Eddie’s wife Beatrice, has just the right amount of edginess coupled with the solid loyalty to her husband, even though she knows he is wrong. Marco (Alexander Greenwood-Forkin) and Rodolpho (Stan Dooley) are the hot-headed Italians who unwittingly play a part in Eddie’s tragic downfall and both actors establish their characters and, in particular, Marco’s sense of pride and honour as the drama unfolds. The lighting (John Cordery and Crispin Bishop) was just the right side of brooding during Alfieri’s cautionary narrative links before taking us into the simple but effective set – the brightly-lit interior of the Carbone’s tenement apartment. There was fine attention to detail both in the set and the costumes (Maddy Winter and Julia Calvert), which were all spot-on. One of the dangers of putting on a very strongly American production like this is maintaining the accents, but the principals all held their own and the production moved on at a good pace, eliciting both laughs and empathy when required. Director Roger Follows showed an assured touch all leading up to the final tragic tableau, as the audience enthusiastically applauded a very accomplished production. 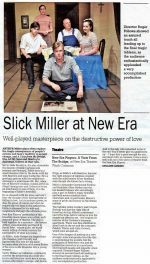 And to the lady who remarked to me at the end ‘You’d better give it a good write-up’ – I hope this is good enough for you, and deservedly so, because it was a story well told and a fine piece of theatre from the New Era Players. 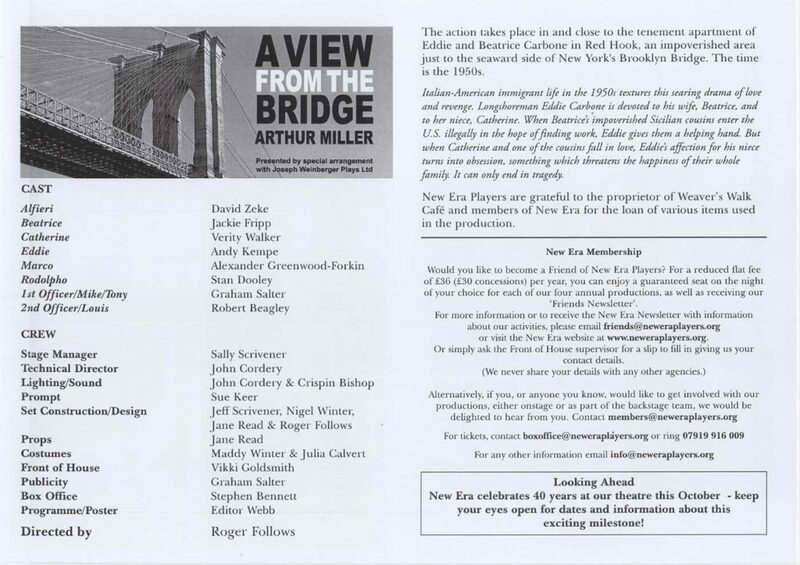 The play is about an Italian immigrant family, living and working in the shadow of the Brooklyn Bridge in New York, who over the course of the play make a great job of destroying themselves! Mr Alfieri is the narrator and lawyer who tells the story to the audience from his point of view, bridging the gap between American and ‘Tribal’ Italian law. The Carbone family, Eddie, his wife Beatrice and her orphaned niece Catherine, are poor but content. They live in Red Hook, Brooklyn, where Eddie works in the shipyards. When Beatrice’s Italian cousins Marco and Rodolpho, illegal immigrants, arrive to stay, the Carbone family’s life changes forever. Their loves and loyalties are tested with tragic results. Eddie harbours a secret lust for Catherine which is tested when Catherine and Rodolpho fall in love and decide to get married. He does all he can to dissuade Catherine from marrying Rodolpho. Beatrice has become aware of Eddie’s feelings for Catherine and tries, without success, to steer him back to reality. Alfieri, also aware of Eddie’s situation, advises him to change his ways. Eddie ignores them and, as a last desperate attempt to stop the marriage, betrays Marco and Rodolpho to the Immigration Police, who arrest them for deportation. His family and neighbours now all hate him for this. The cousins are out on bail and Marco hunts Eddie to settle the score for his betrayal, ‘Italian Style’. They fight and Eddie draws a knife which in the scuffle is twisted round and Eddie is then stabbed with his own knife. He dies in Beatrice’s arms asking and receiving her forgiveness.